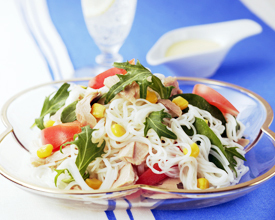 You can enjoy Somen all year round! 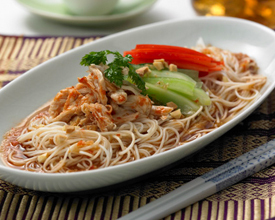 This section is full of creative ideas on how you can cook Somen in a variety of recipes. We hope that you try some and enjoy them! 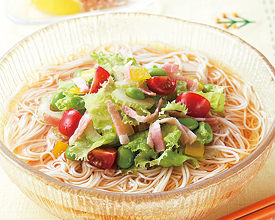 Somen arranged and garnished with colorful ingredients. 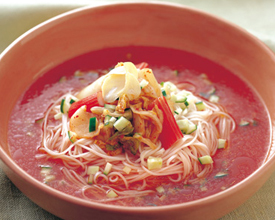 One of the most popular dishes for Japan’s hot summers. 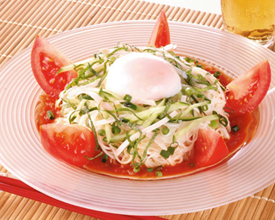 Salad-style Somen with fresh ripe tomatoes. Canapé flavored with basil Basil tastes and smells like perilla (ooba). This recipe makes the acidity of the lemon mild. Worried if the air-conditioning is drying out your skin? Get vitamins to make your skin beautiful from the inside out! 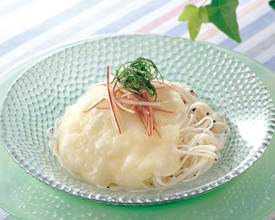 A fresh harmony between apples and Somen. Sweet and sour apples make this recipe refreshing. If you have difficulty finding time to eat in the morning, nutritious apples are great when you’re on the go! A cool and refreshing sauce for the summer. Spicy kimchi will increase your appetite! 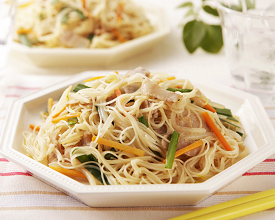 If you don’t feel like eating lunch in the hot summer, this cool and piquant Somen recipe is perfect for you! A hors d'oeuvre with dill, an invigorating herb with a refreshing flavor. 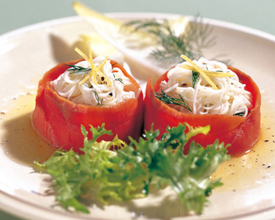 Use plenty of dill, which goes well with smoked salmon. 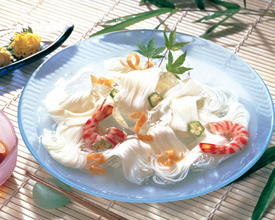 A western-style Somen with the flavor and scent of dill brought out with extra virgin oil and the refreshing scent of lemon. It's Chinese and very piquant! Able to be cooked in 15 minutes. We are often busy and tired from the rush of everyday life. 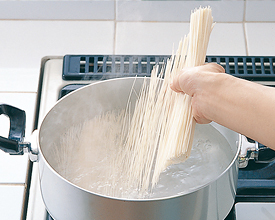 Try this recipe to build up your body strength! 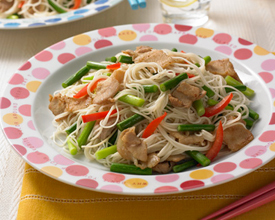 This combination of pork and garlic will increase your stamina. Able to be cooked in 15 minutes. 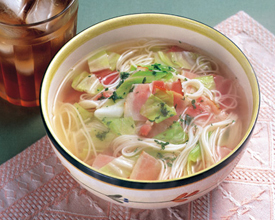 Easy cooking with chicken soup. 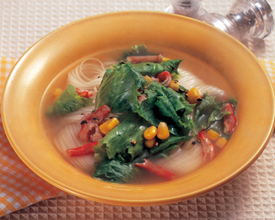 The richness of bacon is the secret of this savory soup! 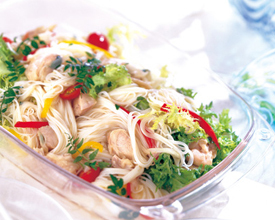 Plain nyumen in salad-style. 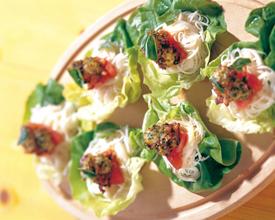 Enjoy the crispness of lettuce!